Anyone who has spent time browsing the Tripawds Gift Shop lately may have noticed these new three legged Golden Retriever designs, now available on t-shirts, hoodies, bags, mugs, gift cards, and more . 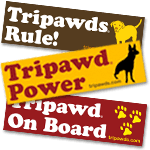 Show the world you love your Tripawd Goldie with the latest addition to our Front Leg Tripawds design selection. 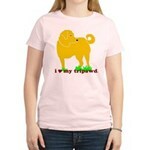 This new I Love My Tripawd Golden Retriever three legged dog design was inspired by canine cancer hero Jake, and other front leg tripod dogs of the Tripawds Blogs community. Anyone with a three legged Goldie knows, Golden Tripawds Rule! Show the world that all Goldie tripod big dogs are lovin’ life on three legs with this new Rear Leg Tripawds t-shirt design now available on bags, mugs, gift cards and much more. Both new designs are now available on two-sided t-shirts too! 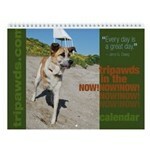 Scroll down to the bottom of either the I Love My Tripawd or Tripawds Rule t-shirt pages to see the selection. The front pocket area features Jerry’s tripawds.com logo, with the three legged Golden designs in full size on the back. 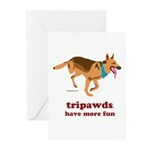 And of course, the Tripawds Gift Cards selection has been updated with these new designs as usual. 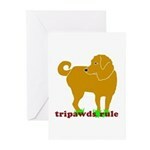 Send some to your Tripawds friends as a get well, welcome home, or sympathy card, or just to say hi! My pawrents bought some great gear with the Goldie on it and love it. They even bought some of the coffee mugs to take to my oncologist to give as a “Thank You” gift. 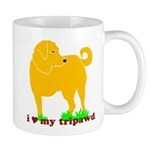 Now everyone will know that we think Goldie Tripawds rock! Thank you gifts … what a great idea! Thank YOU! Golden Tripawds do rule! Love it! !